We specialize in all inshore gamefish such as striped bass, fluke, weakfish, flounder and bluefish on the Jersey shore. We customize your trip to your liking. Book your charter boat fishing in NJ now for stripers 2018 season. Our 2005 31′ Contender charter boat is available for day and evening fishing trips up to 6 passengers. Please see our private charter boat rates. To book your trip or if you have any questions, please call Captain Erwin at 908-477-7537. 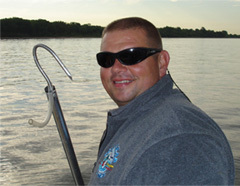 Captain Erwin Heinrich has a passion for watching people catch fish, especially children. Visit our deep sea sportfishing rates page for our trips. Scales N Tales is where you’ll find a fun filled day on the water. Check out NJ saltwater fishing reports and blogs in my Captain’s Log. You can read about my past trips and latest news for this season. Scales N Tales is a custom 2005-31’ Contender Center Console powered by twin 2016 300 Yamaha..
Don’t forget to bring your kids fishing! My goal is to give my clients an exciting and memorable day on the water! We will customize your fishing experience to your liking.